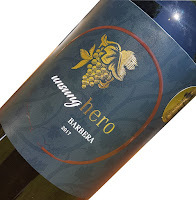 Unsung Hero is a side project for winemaker Andy Williams, and what an entry he has made with this debut wine! Such a beautifully presented Barbera, this will bowl over many who choose to stand in its way. Luscious fruit is matched with deft savoury touches. The energy the fruit exudes is impressive - the whole package well considered. Dark plums and dark cherries walk with tar, boot polish and aromas of sandalwood. The more I dig around, clove and dried Mediterranean herbs swim deep, yet at no stage is the delivery bulky nor weighed down. The fruit dances through the mouth and rides long with well-balanced acidity having the last word. A super wine - bravo!